There is a pretty sweet Fashion Friday, Black Friday merge. Right now, pick up some of your Wardrobe Favorites from Cents of Style for for $15 OFF (items starting under $10). Additionally, everything comes with FREE SHIPPING! Create a fun Black Friday Outfit with some of the must-have pieces of the season. Now is the time to get your hands on our most popular moto jeggings, everyone’s favorite beanie (this is the lowest price on this yet), and softest scarf EVER. I am absolutely loving this super trendy lace-up sweater. Together, these pieces make the perfect ensemble, and with all the color options, you’ll be able to create an outfit that is all you. 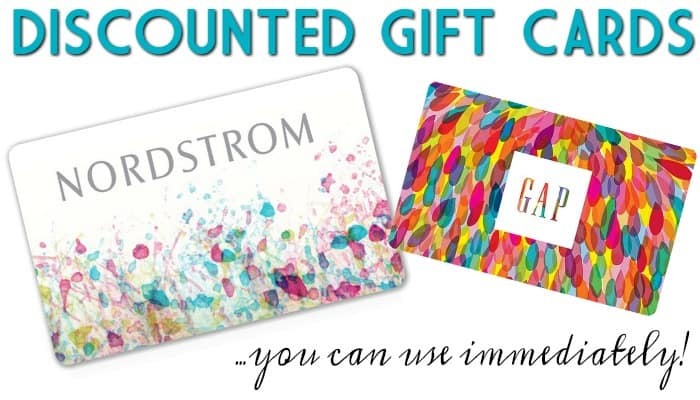 If you spend $50, take a look at this freebie below! The Cents of Style Black Friday Code BF2017 is valid 11/24 through 11/26. Love the Cents of Style Feel – Be sure to check out Jane and Groopdealz – adorable items! Stay up to date with Frugal Coupon Living’s Frugal Fashion Fridays too! WOW – waste no time grabbing this deal. Nordstrom has 46% off Hunter Boots. This brings many styles down to $80.40 from $150. FREE shipping and returns to Nordstrom. You can also grab these boots as low as $90 shipped from Amazon.com – I love the pink style! Note: prices change often on Amazon so be sure to all look at other Hunter Boot Options here too. My favorite Gloss Red Hunter Boots are $79.99 HERE. There are other colors to choose from too. For sizing, some say go a half size down. WOW – waste no time grabbing this deal. Update – Look at this sale a a popular department store. Grab Hunter Boots $80 from $150! 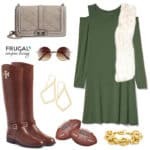 Fall Sweater Dress Outfit – It’s another Frugal Fashion Friday and this week we have a trending oversized sweater dress, perfect for the Autumn season. Comfort and Style. This dress would be adorable for your Thanksgiving dinner. No buckles or buttons to undo after a fancy feast. We also love the elegance (and price) of these tall suede boots. 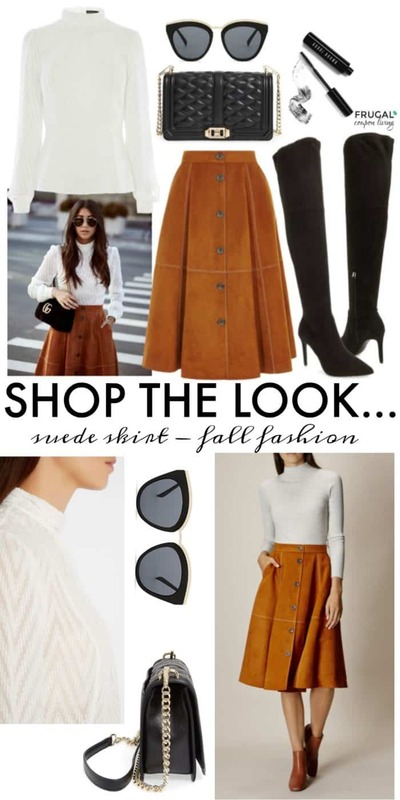 Don’t forget last week’s Frugal Fashion Friday Outfit, the Suede Skirt Fall Fashion – Pin It. 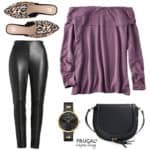 Suede Skirt Fall Fashion – It’s another Frugal Fashion Friday, this week a chevron sheer top and faux suede skirt to complete your fall fashion outfit. The perfect Thanksgiving outfit. We found the most excellent outfit for Thanksgiving dinner with this faux suede skirt and chevron blouse. Pair it with some black accessories – tall over the knee boots, a quilted handbag, cat-eye sunglasses and a pop of stand-out eyes! 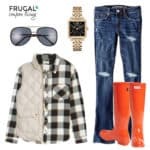 Don’t forget last week’s Frugal Fashion Friday Outfit, the Edgy Fall Fashion – Pin It. WOW – waste no time heading to 6pm and shop their Hunter Boots Sale! We are seeing boots as much as 60% off. You will want those red shinney ones for the Christmas season! Every order of $50 or more will score FREE shipping. Head to 6pm for a look. 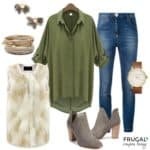 It’s another Frugal Fashion Friday, this week we provide some Edgy Fall Fashion while still giving you comfort and glamour. A staple in your closet, this season and the next, are Faux Leather Leggings. We pair these leggings with a top that is comfy and cute. You guys have to take a look at this Purple Off-the-Shoulder Tunic. We are pretty in love with it, even with some jeans and casual booties. Pair with some trending leopard mules, a saddle bag and stand out watch. Happy Fall! 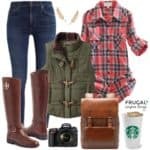 Don’t forget last week’s Frugal Fashion Friday Outfit, the Cozy and Comfy Fall Outfit – Pin It. It’s another Frugal Fashion Friday with Cozy and Comfy Fall Fashion. 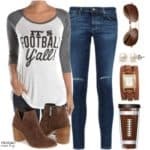 Clothing that is comfy, cute, and trendy for the Autumn Season! It can be hard to look cute when all you want is to be comfy. That is our goal with this cozy and comfy fall fashion piece. Relaxed jeans and an oversized sweater – polish off with adorable earrings and a stand out purse. We love this Chloe knock-off, you will love the price too! Don’t forget last week’s Frugal Fashion Friday Outfit, the Relaxed Weekend Loungewear – Pin It.